For those of you living under a rock who aren’t familiar with Clue aka Cluedo, this classic board game requires players to solve a murder mystery by collecting clues. The Cluedo Slot replicates the popular game. Reels contain images of all the murder suspects and weapons. The graphics need major improvement, but the generous bonuses make this game good enough to kill. I simply cannot deny the appeal of slot machine based on the board game, Clue. This was one of my favorites as a child, and it’s exciting to re-live the experience. 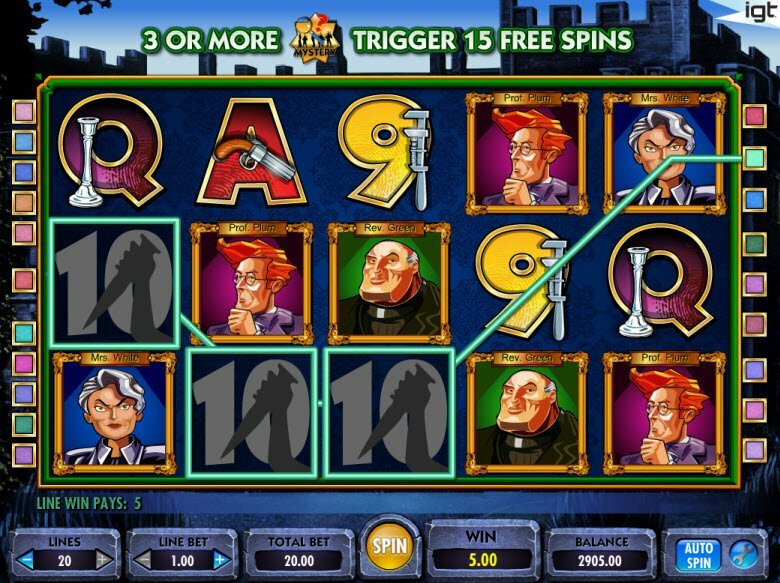 IGT software’s version of the Cluedo Classic Slot Machine features all the usual suspects from the game including Miss Scarlet, Professor Plum, and Colonel Mustard. As the reels spin, intriguing music plays in the background, setting the tone for a murder mystery. Unfortunately, the images aren’t very good quality which really takes away from the game’s potential. 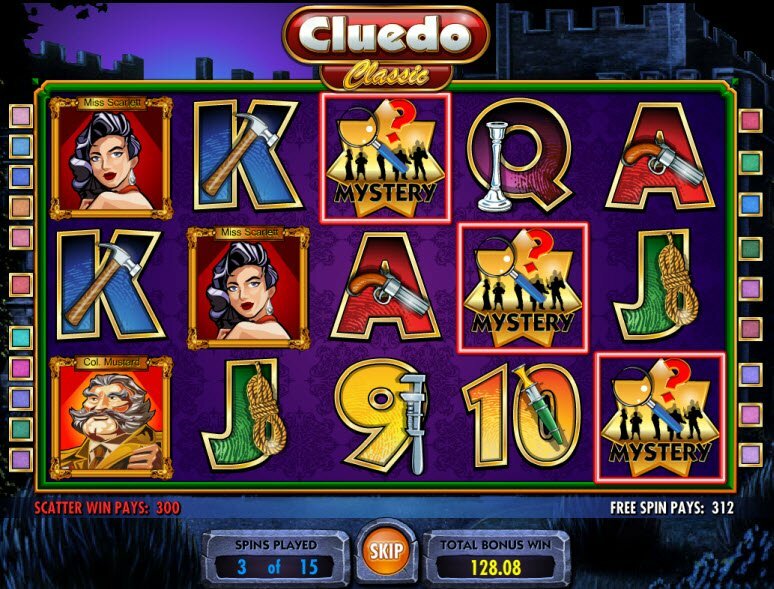 The Cluedo Slot has one of the most generous payouts among casino games. As I played, I frequently won multipliers and free spins on top of free spins on top of… you guessed it!... free spins! 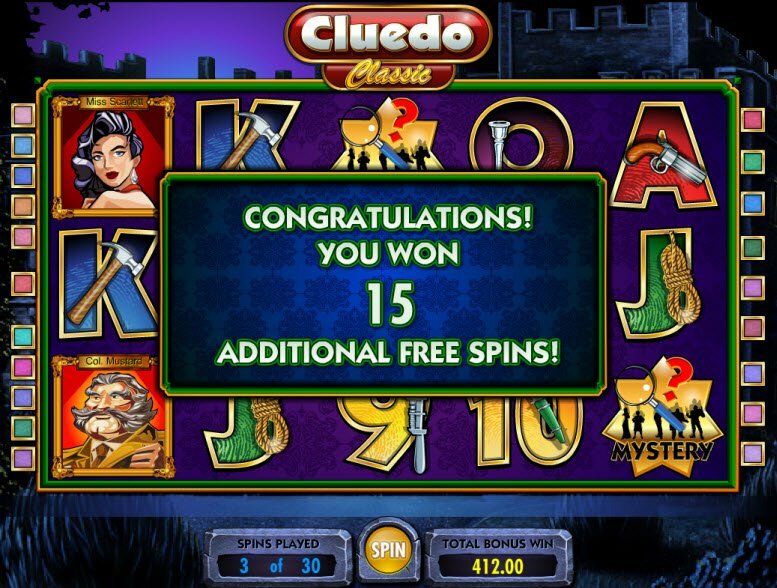 The Cluedo Classic Slot bonuses have one of the most generous payouts among casino games. As I played, I frequently won multipliers and free spins on top of free spins on top of… you guessed it!.. free spins! It’s all thanks to this generous little Mystery Icon. The Mystery icon serves as the Bonus symbol. When 3, 4, or 5 of these icons appear on the reels, the game immediately awards 15 Free Spins. As an added bonus, all wins are tripled during the Free Spins. An additional 180 Free Spins can be triggered during this bonus. The Mystery icon also represents the scatter which awards huge multipliers up to 100 times the total bet.